Make & Personalize your own card! More Sizzix cards for Girls! Classy Lady with a Classic Style! Cards with pockets are useful in our Chinese culture especially for putting "ang-pows" for different celebrations -weddings, birthdays or just a gift to a friend! This one holds a tag which doubled as bookmark! No...Daniel doesn't smoke...just pretending to be Sherlock Holmes...not kidding! We found the wooden handcrafted pipe in Kuala Trengganu, in an antique shop in China Town & immediately thought of him. He loves it! Besides these 3 developmental deficits, these children are often also affected by other developmental delays such as language difficulty, learning difficulty, & also by sensory dysfunction i.e. malfunction any/many of our 7 senses - taste, smell, touch, sight, hearing, sense of balance & sense of space. Daniel is now16 years old & goes to Sibu Autistic Centre at Agape Centre, Sibu, attending a young adult programme. Daniel is the reason why I have started the centre for children with autism & related disorders! Daniel is very lovable i.e. when he doesn't scream or bang with his fists when angry or in pain! He is like anyone else! He wants/loves attention, gentleness, & not being left out by the rest of the family! He gets extremely frustrated when not understood & he LOVES oranges! 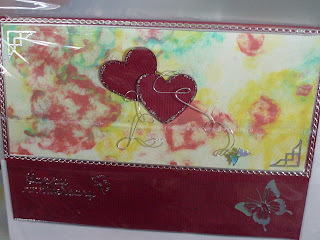 Making use of craft wires can created interesting contrast & texture to a card. Stickers are also so easy & useful especially when you are rushing for last minute party invitations... Here, I used a recycled/handmade paper which by itself its already so beautiful! I only need to jazz it up with some border stickers, cut up 2 hearts & wind twisted craft wires around them & attached butterflies to the ends of the wires. You can also string beads or buttons into the wires for more blings! Wah...lah...done! So easy...! Saves you both time & money, & your friends will definitely appreciate it because you can personalize them! My best friend, Laura (MUST check out her blog at: (http://www.handmadecardsbylaura.blogspot.com/) to purchase JEART dies & machine & see her step by step guide in making her amazing cards!) introduced these beautiful dies to me for making unlimited creative works, maybe limited only by your own imagination! Another version with the same dies! The cupcake was cut out with a Sizzix die from a cork sheet for that special texture for a realistic look of a well-done cupcake & topped with glitters for a delicious topping! This card was inspired by a tag I saw in a magazine & it reminds me of the all the pizza lovers. This card is great for many functions - invitation, thank you, birthday ! I used Sizzix dies (shaker box) to cut out the pizza box, some beads & bits of foam pieces for the pizza & topped it with some mulberry paper for cheese....! A bouquet of flowers is so versatile! It can bring tremendous pleasure, comfort, love or joy at any time, season & occasion without going out of fashion! I embossed the background & framed it with border stickers. I found a piece of gift paper with many teddy bears of different sizes & cut out one to fit this card. The quilled flowers were arranged & attached onto a piece of tissue paper. Another version of A Bouquet for You. I used a bigger teddy bear for this one holding a bouquet behind him & a present on the other. This birthday card was for a very special friend & neighbour who has been our faithful babysitter for my special son for many many years! I love quilling & the flowers on this card are all hand-quilled, the felt heart embellished with sparkling beads & the bowl cut out from Sizzix dies. This card always brings a "WOW" from whoever receives it....& the pleasure is all mine! I used Sizzix dies to cut out the dress & accessories. You can always change or choose the colour & pattern of the papers to suit your own style or whoever you are making it for! I cut out a piece of doily for the lace, attached ribbon roses for the dress & matching handbag, stickers for the frames & corners, & my signature finish is tying some matching beads to the edge of the card. Enjoy!